Dyron, Was kind and courteous. Timely, great communication. Very professional and friendly. Informative. He had to come out 4 times as the replacement parts were either scratched worse than the original (twice) or they were the wrong part. They got it right on the 4th attempt. Repair technician was very friendly and on time when he arrived. Repairs were professionally done. I was very happy with the entire process. Representative was very courteous and professional. 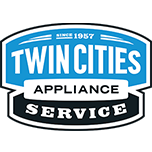 Dyron is a very pleasant and competent repairman for Twin City Appliance. He shows great care of our home and appliance, is very thorough and makes sure we are completely satisfied with the repair. We will certainly use his service again. Ryan was fast, did great work, and explained everything thoroughly. Couldn't have been happier with our experience. DISHWASHER WHIRLPOOL WDT750SAHZ0 Installed adjuster kit and tested. OVEN WHIRLPOOL WFG515S0ES1 "On the preheat for 350 bake the oven reached. 495.8 degree at the chime. Monitored the bake temps, 420.5, 350.8, 419.6, 348.7, 418.2, 352.4 so running temp of 385. Calibration was set at +30. Setting back to 0 degrees will produce a run temp of 355. Customer to monitor. Also having issues with the front right power burner not lighting consistently so will new new style caps. ; ordrng 1 W10881749 (cap-burner)"
WASHER MAYTAG MVWB955FW0 Verified stored f5e3 code. Ran through a diagnostic cycle and all checks ok. Also put into a manual test and tested the lid lock by locking and unlocking it many times. Worked every time with no fail. May have been a restriction on the lock at the time of the error which is now gone. Customer to monitor and if happens again will need to replace the lid lock. DISHWASHER KITCHENAID KDTE204DSS0 Installed sump ran 10 minutes no leak. MICROWAVE WHIRLPOOL WMH31017HS2 Installed control light now operational. DISHWASHER KITCHENAID KDTE204DSS0 "Leaking at sump and OWI sensor corroded terminal will need new harness, 3-1 error sensor, submit for approval. Parts 265.00 schedule return PVR 2; ordrng 1 W10911101 (harns-wire) and 1 WPW10455260 (pump&motor) and 1 WPW10705575 (sensor)"
DISHWASHER WHIRLPOOL WDT970SAHZ0 Plugged airgap removed restriction now drains correctly. WASHER WHIRLPOOL WFW75HEFW0 "Installed new front panel on the washer and transferred ms tag. All checks good on new front, no issues or defects." REFRIGERATOR KITCHENAID KRFC604FSS01 Picked up door from porch. RANGE WHIRLPOOL WFG515S0ES1 "Temperature test at 350 336,337,340,390,390,389 average 364 gave unit offset -20F"
REFRIGERATOR KITCHENAID KRFC604FSS01 Installed left side door operational. DRYER WHIRLPOOL WED75HEFW1 "Broken knob tech had a used knob till new one arrives, inner door looks recessed into outer door not making door switch please xpart door parts, unit also not heating heat relay closes correct voltage to unit ordering cut offs and heater if needed checked air flow it is good. ; ordrng 1 280148 (cutoff-tml) and 1 W10772479 (OUTER DOOR) and 1 W10875909 (knob) and 1 W11251345 (DOOR) and 1 WP3387747 (element) and 1 WP8557403 (thrmst-fix)"
DISHWASHER WHIRLPOOL WDF330PAHW2 Installed sump no leaks operates correctly. DRYER WHIRLPOOL WED75HEFW1 "Replaced cutoff and t-stat, obtained 21 amp draw on heater, again door switch bypassed awaiting parts. ; saved tckt"
WASHER WHIRLPOOL WTW4855HW1 Drain hose hitting back panel secured. No error codes. HOOD WHIRLPOOL WVW51UC6FS1 Installed new lower chimney on the until. New lower chimney is free from any dents. All checks ok. Verified connection to lights and tightened. If the light issue comes up again will need new led driver. OVEN KITCHENAID KSGG700ESS1 "No error codes, tested unit ignited correctly let unit cycle 4 times every time ignited correctly customer states maintains temperature at the moment unable to duplicate stated concern, left business card." DRYER WHIRLPOOL WED75HEFW1 "Wrong part received, w10198431 was part sent. Whirlpool doesn’t have correct part for the door so they are contacting customer for replacement." REFRIGERATOR WHIRLPOOL WRF736SDAM14 "Before arrival customer partially defrosted freezer melting ice build up hitting evaporator fan ran diagnostic still a little left hear a scrape when fan turns off, gave customer option of completing defrost themselves or pay 135.95 labor for tech to complete chose to do it themselves, all thermistors and defrost circuit tested good set defrost to 8 hours customer paid 97.95"
WASHER MAYTAG MVWB835DW4 "No error codes found. Ran an auto test. All tested ok. Ran a load of bath towels on deep water and the same load on normal. No unusual sounds heard. Customer had a plumber install anti hammer arrestors to reduce pipes hammering in the walls. Hammers are installed upside down. Advised customer on cycle selection, detergent use, load size and type"